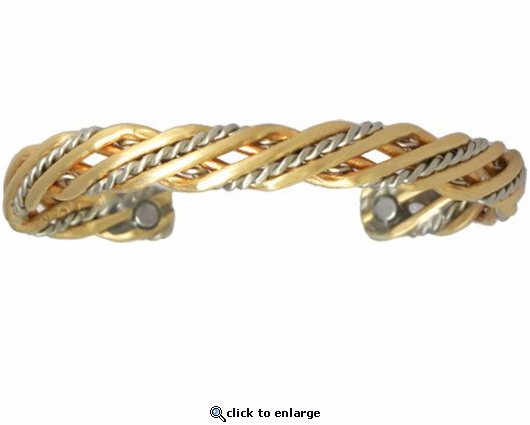 This handmade magnetic bracelet which Sergio calls Trellis Brushed was inspired by the Napa Valley vineyards. It has two rare earth magnets and is made of pure metals. The brass is made from about 85% copper. No plating is used and it is Made in USA. I purchased this as a gift. It was beautiful, and the one that received it loves it. While it was purchased as a last minute gift, the package was delivered on time. A great value for the money. Much thanks to the store. Very nice bracelet. It's hard to tell that it's a copper magnetic item. It did work for me. I have some relief for my carpal tunnel finally! 5 Stars for the Bracelets!